Everyone knows China is going to build multiple aircraft carriers. It’s obvious. Even India has more than one, so one would not expect any less from China. Yet China is keeping it all under wraps. Authorities in the city of Changzhou were suitably pleased with the Jiangsu Shangshang Cable Group when it won a supply cabling contract for the People’s Liberation Army Navy’s (PLAN) second aircraft carrier. They naturally put the news up on their verified Sina Weibo social media account, and the Changzhou Evening News carried word of the victory as well. That was until both organisations’ posts were swiftly deleted at the direction of China’s propaganda authorities. What’s the point? Song Xue, the PLAN deputy chief of staff, already told the world back in April 2013 that China ‘will have more than one aircraft carrier’. Later, Wang Min, the communist party secretary of Liaoning Province, said this second flattop should be completed around 2020. Censors ordered his remarks be deleted too. The duplicitous path that China navigated to obtain its first aircraft carrier was chronicled in exclusive articles by the Hong Kong-based South China Morning Post last month. Beijing acquired its maiden carrier from Ukraine in the wake of the Soviet Union’s collapse. Although procured in 1998, Liaoning did not commission until September 2012. Details of the stripped-down carrier’s procurement are entertaining in the extreme. Xu Zengping, a Chinese-born, Hong Kong-based businessman revealed he bought it for US$20 million, complete with intact engines. China said the propulsion system had been removed. The cover story was that it would be used as a floating casino in Macau. It never was. Xu, a middleman for the PLA, was told to buy the incomplete carrier with his own money and without tacit support from Beijing. Buying her was the easy part, for it took four years to get the carrier to Dalian. Turkey would not let the ship through the Bosphorus Strait so she had to turn around. ‘I felt so helpless when the ship was waiting at the mouth of the Bosphorus Strait. At one point, I was prepared for the worst: we would rather have the giant ship go to the bottom of the strait than let it fall into the hands of states hostile to Beijing, like Japan,’ Xu told the South China Morning Post. Oddly enough, arch enemy Japan was not really in the carrier market at that time. President Jiang Zemin visited Ankara in April 2000, and promises of Chinese tourists and opening up its markets to Turkish goods won the day. 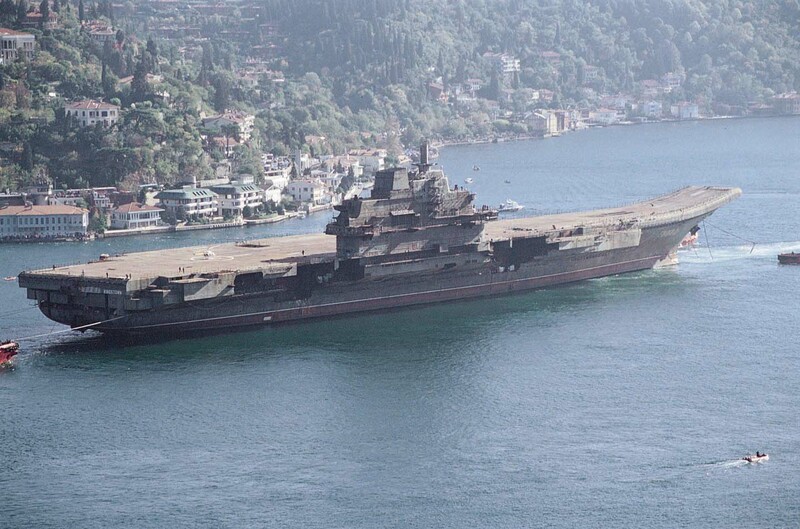 In November 2001, Turkey allowed the carrier through to the Mediterranean. Xu noted, ‘US$20 million was just the auction price of the carrier. In fact, I had to pay at least US$120 million for the deal from 1996 to 1999. But I still haven’t received one fen from our government. I just handed it over to the navy.’ In fact, it took him years to pay off the debts he incurred at that time. What admirable patriotism! I can’t imagine any other businessmen who would have bothered to buy their navy an aircraft carrier. Incidentally, Liaoning carries the pennant number ‘16’ because it took 16 years to get the carrier into service from start to finish. Yes, China is locked in acerbic territorial disputes with neighbours in both the East China Sea and South China Sea. Yes, China repeatedly accuses Japan of returning to its militarist past. Yes, China’s defence budget is growing far faster than Japan’s, and far outranks ASEAN’s defence budgets combined. So why the pretence and secrecy? Would neighbours not feel more trusting if China could simply tell the truth about what it is spending its money on? It seems there is very good reason why China ranked 176th out of 180 countries for press freedom in the latest annual list from Reporters Without Borders. The next one will have to be built from scratch so I hope they have done their research it will be a challenge! They’ve had many years to figure, copy & improve upon the one they already have! True, Singapore is very secretive. Unnecessarily so in my opinion. Interestingly, Singapore only ranked #153 in the list of 180 in terms of press freedom. Then again, it isn’t antagonising neighbours by claiming maritime territory either. Singapore asserted its claims on a small territory called Pedra Brancabut not via military force. And in a likely future conflict, Singapore may end up siding the US over Asia-Pacific claims.